Fruits are some of the healthiest and most delicious foods you can eat. They are sweet and act as a great dessert. Not only are they a great food, but they offer numerous health benefits that are great for the body spanning from the immune system to fiber to a healthy heart. 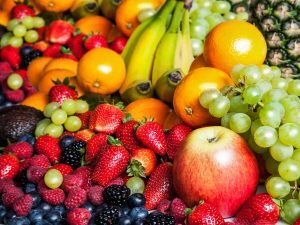 These are the top ten healthiest fruits. 10. Peaches – Peaches contain a high amount of potassium that boost nerve and muscle health. The skins of peaches are rich in antioxidants and fiber. Peaches also go great in dishes ranging from pie to cobbler. 9. Pineapple – This tropical fruit is packed with bromelain, an anti-inflammatory enzyme that has been shown to reduce the risk of heart attacks and strokes and increase fertility. This food can be served grilled, frozen, dried, and freshly cut. 8. Grapes – This fruit has been proven to fight heart disease and high cholesterol, due to the high levels of antioxidants quercetin and resveratrol. They also have a lot of potassium and iron which can prevent muscle cramps and anemia. Purple and red grapes contain the highest concentration of healthy compounds. 7. Kiwis – After peeling back its fuzzy skin, kiwis are a delicious, succulent fruit loaded with vitamins C and E. These vitamins protect against cancer and promote eye health. They’re low in calories and high in fiber. These snacks can last up to four weeks in the refrigerator so they’re good year round. 6. Mangoes – In the last few years, mangoes have become more and more popular. They have exceptionally high levels of beta-carotene which the body converts into vitamin A. They promote bone growth and a healthy immune system. They also have more than 50 percent of your daily vitamin C, more than oranges. 5. Apples – An apple a day may not be such a bad idea considering they are low in calorie and high in quercetin, an antioxidant that protects brain cell degeneration. Apples can also reduce your chances to develop high blood pressure and heart disease. It can lower cholesterol, prevent colon cancer, and promote healthy teeth and weight loss. 4. Pomegranates – This fruit is a great source of potassium which sustains energy and controls high blood pressure. They also could improve your cardiovascular health and lower cholesterol. 3. Grapefruit – Oranges are hailed for being a great source of vitamin C, but grapefruits contain even more than an orange. It also has high levels of fiber, potassium, and vitamin A. Some studies have shown the possibility to alleviate the symptoms of arthritis and repair damaged or oily hair and skin. 2. Bananas – There’s so much to say about this delicious fruit. They’re full of potassium and fiber to keep you energetic and alert all day long. They contain no fat or salt and are a perfect snack. Bananas can be used to make pancakes, banana bread, cookies, and many other tasty treats. 1. Blueberries – This fruit has been long considered a superfruit amongst all fruits and foods. These tiny but powerful fruits are loaded with antioxidants and vitamin C to help fight disease and boost brain power. These fruits are great in pancakes, smoothies, muffins, and so many other desserts and foods. Fruits are extremely healthy and delicious foods that can be incorporated into your diet and into so many great foods and desserts.